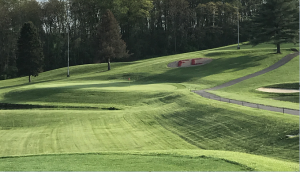 *Ft Cherry Golf Club is a beautiful public 18-hole golf course located in scenic Washington County Pennsylvania (just 12 miles from Robinson Town Center & 15 miles from Washington PA). *A multi-faceted facility, Ft Cherry Golf Club has an abundance of amenities including a driving range, practice green, motel, bar, restaurant, concession stand and multiple banquet rooms. Our Grand Ballroom can accommodate up to 500 guests making it the perfect facility for wedding receptions. We provide full catering and bar service for all events hosted at the club. *Ft Cherry offers various day and overnight golf outing packages at affordable rates. Our staff is committed to making your time at the club enjoyable.